The glucose tolerance test is one of the best ways to find out if your body is metabolizing blood sugar well. Everything you eat and drink, except water, is eventually transformed into glucose in the body. Glucose is also known as blood sugar level, and it acts as a fuel for the brain. However, having more glucose in the body isn’t necessarily a good thing. The body requires energy to carry out multiple processes and functions. It uses glucose but only needs it in moderate amounts, not too much at once. Problems with blood sugar level appear when there is too much glucose in the bloodstream which facilitates inflammation, infection and the development of diabetes type 2 which is a life-threatening disease. Glucose is processed in the body using insulin which is a hormone secreted by the pancreas. Insulin is a hormone secreted by the pancreas. Its job is to normalize blood sugar levels and reduce the amount of sugar present in the bloodstream. When too much sugar is detected in the blood, the brain sends a signal to the pancreatic cells to start secreting insulin. The insulin hormone “opens up” cells and tissues to absorb glucose (the fuel). This effect makes them function normally and ensure that the blood sugar level is stabilized. Insulin resistance develops when cells and tissues no longer “open up” to absorb blood sugar. This dysfunction makes people feel relatively lethargic and fatigued. Additionally, since the sugar in the blood is not absorbed, it will simply stay in the bloodstream which is a bad thing. Having too much sugar in the blood can lead to chronic inflammation, fatigue, poor sugar level control and the likelihood of developing type 2 diabetes. Insulin resistance develops over time. This happens as a result of a sedentary lifestyle and unhealthy diet, among other factors. It might take years to develop insulin resistance since this is a gradual process. It is very important to monitor blood sugar levels and prevent insulin resistance which can lead to diabetes type 2 and a poor-quality life. · Acute stress – being under a lot of pressure and having to deal with lots of stress on a daily basis can also lead to the development of insulin resistance. People of an elderly age are more predisposed to develop insulin resistance. However, the quality of the diet and the exercise regimen are primary factors which contribute to insulin resistance. Once cells and tissues become more resistant to insulin, diabetes type 2 can appear. This disease develops slowly over time and requires major lifestyle adjustments to manage it properly. There are several types of diabetes, and it is a good idea to learn something about each of them. Diabetes type 1 is also known as juvenile-onset diabetes or insulin-dependent diabetes. People who have this disease produce little to no insulin for reasons not completely understood by science today. Insulin is vital to process sugar into the bloodstream, and if the body doesn’t make it, it has to be injected. This illness can be encountered at all stages of life, but it usually affects children. Patients with type 1 diabetes need to rely on periodic doses of insulin to stay healthy. If insulin is not administered at certain moments, these patients can develop health complications which might result in death. Diabetes type 2 is one of the most common types of diabetes. It is caused particularly by insulin resistance which makes cells “harder” and less predisposed to absorb sugar from the bloodstream. Approximately 90% of all diabetic patients have diabetes type 2. It can appear at any age, and it is usually detected and diagnosed using blood glucose tests. People can live with diabetes, but they need to follow strict dietary guidelines and eat foods with a low glycemic index. Diabetes type 2 can be reversed, but only in rare cases and using special diets for a low period such as the ketogenic diet. At some point in time, if diabetes type 2 condition progresses, patients require oral drugs and additional doses of insulin to survive. This disease can also be managed through a steady fitness regimen and by reducing stress levels. These medical conditions are not without symptoms, and by paying attention to certain signs the body offers, one can discover the illness earlier on and possibly stop its progress. People must know that these symptoms should be consistent over time. If one has the symptoms above, he or she should take the glucose test as soon as possible to properly diagnose the health problem. There are certain groups of people who are more likely to handle glucose in the bloodstream improperly and develop diabetes type 2 in the future. The glycemic index is used to measure how much insulin the body needs to produce to process different types of foods. For example, pure glucose has 100 as a glycemic index (GI) which means that it will generate the highest insulin spike. Broccoli, on the other hand, is a complex carbohydrate with a GI of 15 which is considered to be pretty low. Bananas are somewhere in the middle with a GI of 54. Specialists recommend eating a lot of foods with a low GI because these generate a smaller insulin spike and don’t lead to insulin sensitivity. Monitoring your diet and including more foods with a low glycemic index can reduce the risk of developing insulin resistance. Glucose can be tested very simply using a glucose meter which uses a single drop of blood to determine the amount of sugar in the body. The most common test is performed after a fasting period of 9 to 12 hours. The patient refrains from eating food or drinking anything else than water for up to 12 hours; he goes to a lab where the doctor gets a blood sample and has his glucose level measured instantly. A normal fasting glucose level is less than 100 mg/dL. A glucose level between 100 and 125 mg/dL is considered to be prediabetes. In this case, the patient needs to carefully monitor his or her blood glucose level and try to prevent it from rising. Glucose levels can decrease with diet and exercise. If the glucose level is higher than 125 mg/dL, then the patient has diabetes. This should be confirmed in two separate tests to avoid false diagnosis. Blood sugar can also be tested using a special test called a Glucose Tolerance Test for 2 Hours. What is a Glucose Tolerance Test (GTT)? This test is more thorough, and it can easily discover glucose intolerance, metabolic syndrome, insulin resistance, impaired pancreatic cell function or different other health complications. Its primary role is to determine how the body handles glucose at certain time intervals. Patients begin by eating a balanced meal which includes at least 150 grams of carbohydrate per day for three days before the test. They are not allowed to drink anything but water for these three days, and they should discontinue nonessential medication which might interfere with the test results. Patients shouldn’t eat anything for at least 8 to 14 hours before the test, and they are allowed to drink water only. Similarly, patients shouldn’t do high-intensity physical exercise for at least 12 hours before the test. They are not allowed to smoke or drink coffee either. If water is consumed, it should be plain water, not flavored water. How is glucose tested in the lab? 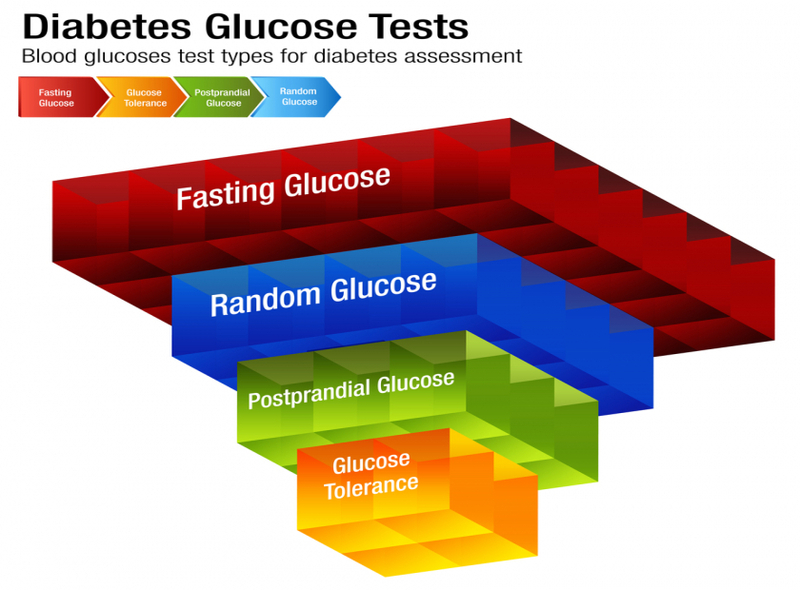 When the patient arrives at the doctor’s clinic, a simple fasting blood glucose test is performed. This measurement requires taking a small blood sample using a glucose device and find out the blood sugar levels. The glucose meter gently penetrates the skin of a finger to let a drop of blood pop out. The device immediately measures the glucose level in the blood. Many people are scared that they will feel pain when the glucose meter reaches for a blood sample, but they shouldn’t be worried. The process is painless, and it is over in less than one second. The second test involves drinking a sugary beverage which contains 50 or 75 grams of sugar. This quickly increases blood sugar levels and determines an insulin spike. The way the body handles this test is an important indicator of sugar levels in the bloodstream and how the body reacts. It is a more thorough and accurate test which offers better results. The glucose drink should be consumed quickly, and the patient needs to wait for approximately 2 hours before taking the test again. During this time, the patient is allowed to talk, read or listen to music. These are relaxing activities which let the body process sugar optimally. After 2 hours, a blood glucose test is performed again. This time, the sugar levels will be higher which is normal. However, if they are excessively high, this might indicate a predisposition to diabetes or a confirmed diagnosis of diabetes. After drinking the glucose beverage and waiting for 2 hours, normal glucose blood levels should be below 140 mg/dL. Levels between 140 mg/dL and 200 mg/dL indicate impaired glucose tolerance. Levels above 200 mg/dL indicate diabetes. What to do after getting the results? Changes in lifestyle should be performed according to the test results. For example, if the fasting glucose levels as well as the ones after drinking a sugary beverage fall in the normal category then it means that the patient has a healthy lifestyle and he or she should continue it. If the glucose levels fall in the “impaired glucose tolerance” then the patient needs to make certain lifestyle changes to prevent getting diabetes at some point in the future. If the tested glucose levels indicate diabetes, then the patient needs to work with his or her healthcare provider to find out appropriate treatment options. Certain diets might be prescribed which include foods that have a low glycemic index, so the blood sugar levels don’t rise too often. Certain foods and drinks should be eliminated from diets altogether such as sodas, chocolate, candies, ice cream, and white rice. It is possible to live with diabetes and even reverse it using special diets, but patients need to be disciplined and follow the advice given by the healthcare provider. Getting more exercise and eating healthier foods is a great way to normalize sugar in the bloodstream, but many people are still confused about what does this mean. It's important to take a closer look at the actual habits one can develop to prevent diabetes altogether and normalize sugar levels. Fiber is seriously underrated. It basically consists of chunks of food which are not processed by the body, so they are eliminated as a whole. The good thing is that fiber gathers up plenty of toxins and unwanted substances from the gut and takes them out during the excretion process. People who have relatively solid stools (which is a good thing) eat a lot of fiber and enjoy healthier guts and a better lifestyle. Fiber also gives a great sensation of satiety, so one is less likely to overeat if he or she consumes a lot of fiber. Back in the days, humans relied mostly on foods taken from the ground or trees, so their fiber intake would amount to approximately 100 grams per day. Unfortunately, nowadays most people get around 15 grams of fiber per day or less. This is a bad thing because if the body doesn’t have enough fiber, stools become loose and hunger pangs appear throughout the day. Fiber also plays a vital role in metabolizing sugar, and it can be as effective as diabetes medication for certain people. Increasing the fiber intake might make patients give up on diabetes medication altogether. Fiber can be easily found in fruit, vegetables, seeds, whole grains, and complex carbs. It is nearly impossible to take all the required vitamins and minerals from food only, and that’s why it is highly recommended for anyone to get a multivitamin supplement. Certain nutrient deficiencies such as a lack of vitamin D or a lack of chromium and magnesium can make the sugar levels imbalanced in the bloodstream. These vitamins and minerals are essential for key metabolic processes, and without them, one can become more predisposed to insulin resistance which can lead to diabetes type 2 in the future. Each health conscious person should make a habit of taking more vitamins such as getting a vitamin D supplement. Alpha-linoleic acid, a type of acid similar to omega-3 fatty acids, is also required to maintain normal blood sugar levels and it can be taken as a supplement. There are certain types of foods which can do more harm than good to the human body. Some of these foods include refined sugars and processed vegetable oils. The bad thing about these foods is that they promote inflammation by activating inflammatory genes. This activation can lead to chronic inflammation in the body which affects cells, tissues and organs. Chronic inflammation also leads to poor insulin sensitivity which translates to insulin resistance and diabetes type 2 at some point in the future. One should try to limit processed oils and refined sugars as much as possible to minimize the chances of having high sugar levels in the bloodstream. Stress is an important factor when it comes to insulin resistance. Most people live stressful lives when they have to juggle numerous responsibilities daily, meet deadlines or work under pressure. The human body is not ready to cope with high amounts of stress which basically consists of the hormone cortisol secreted by the adrenal glands in huge quantities. The key to manage stress is to make a habit to relax and take breaks from work every day. For example, one can do breathing exercises, go for a walk in the park, watch a movie, play a game, do yoga and even take a vacation. By reducing stress levels, one doesn't only live a happy and more productive life, but he or she also has fewer chances of developing insulin resistance. A sedentary lifestyle is one of the worst habits one can have. Lack of exercise drastically increases the likelihood of developing insulin resistance at some point in the future. The human body performs at its best when it engages in physical exercises on a regular basis. This doesn’t mean that one should immediately go to the gym today, but make a conscious effort to move more often throughout the day. For example, taking a 20-minute stroll once in a while can have major positive benefits for health, improving the cardiovascular system and insulin sensitivity. Going for a run is also highly beneficial as well as practicing yoga or engaging in HIIT (high-intensity interval training). The point is to move the body a few minutes each day and slowly build up to a healthy habit of being more fitness-conscious. This can lead to a healthier lifestyle and a healthier mind. The next step is to order the 2H glucose tolerance test today and take action. This test is inexpensive and provides the perfect way to know more about your health with a minimal financial investment.